The Jumbo’s Philly Cheese Steak Sloppy Joe. How did we come up with this idea? Well, when you think about it, it’s kind of a natural. Did you know that the Sloppy Joe is the official sandwich of Jumbo’s home state of North Dakota? Did you know that Jumbo’s was voted the best sandwich in North Dakota? You might say we’re the world champion Sloppy Joe! Philadelphia is famous for their delectable sandwich, the Philly Cheese Steak. Along with Rocky, it might be their most famous export. When in Philly, go to a place like Pat’s, and you can taste for yourself the artistry of the perfect mixture of beef, sautéed onions, green peppers, mushrooms and melted cheese all on a roll. Bring your appetite and ask for extra napkins, because you’ll need them! You might also know that the Philadelphia Eagles recently won the Super Bowl, making them the world champion professional football team. You might also know that they earned the best regular season record with a lot of help from their star quarterback and one of North Dakota’s favorite sons, Carson Wentz. You might also know that the last time Philadelphia won professional football’s highest prize, their star wide receiver–Pete Retzlaff–was also from North Dakota. It seems that when Philadelphia and North Dakota get together, great things can happen! Try this recipe, and we think you’ll agree. Brown ground beef in a large skillet. Drain and set aside. In the same pan, heat the olive oil. Saute the onion, green pepper and mushroom until the onion and green pepper start to soften, and the mushrooms turn slightly brown. Return the beef to the vegetables and stir together. In Philly, they call the combination of onion, mushroom and green pepper “Wit”. You can choose to omit any of these delicious veggies and have yours “Widdout”, but we think you’re missing something special if you do! 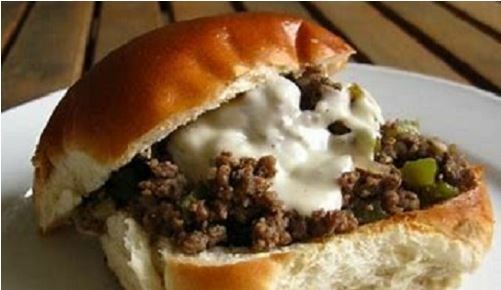 Pour in your jar of Jumbo’s Original or Jalapeno Sloppy Joe Sauce and stir until all meat and vegetables are coated. Simmer, stirring occasionally until the sauce is warmed through and bubbling. Toast your hamburger buns if you choose (who wouldn’t choose this? ), add the Sloppy Joe mixture, and then top with a slice of cheese. You can choose to put your sandwich under a warmer or in the microwave for a few seconds if you’d like the cheese to get melty and gooey.